Facebook doubling donations to Depot 11/27 and more ways to help! We had a great time at Fine Arts Friday at Cherry Creek High School! Thanks to Cat Jafek and others for inviting us to demonstrate. 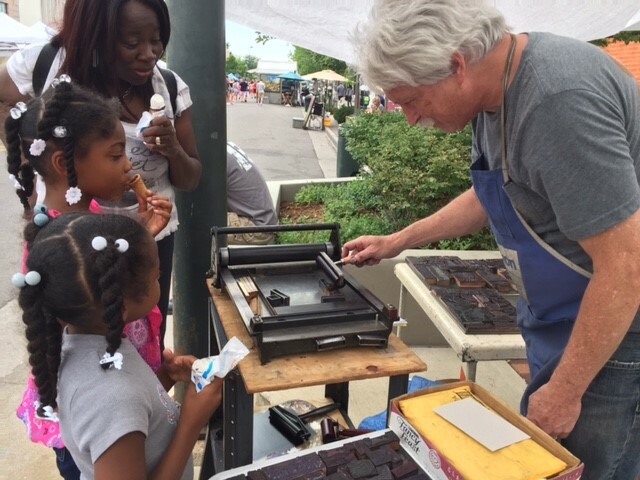 With hundreds of interested students, printers Tom Parson on the Curtis and Mitchell table top press and Marc Silberman on the small Vandercook roller press were kept busy. Last week on volunteer day, we put together a Gordon Franklin press. Who knows what we can accomplish this week on volunteer day (Sat, 11/3, 10-4)? Type inventory to landscaping and yes, to building more presses, there’s always something to do at the Depot. Come down and see. The #MoPrint crowds at the Open Portfolio show (displays by board members Kim Morski and Tom Parson) and those who came to our Open Studios were very interested and interesting. A few pix below, including a kitty who decided hiding in the bushes made most sense. Also check @GenghisKern Insta account for a video from his shop. Thanks to our Saturday volunteers! There was shoveling, plank-moving, talk of how/where to move 6,000+ bricks so we can fix the leaky patio, inventorying and much more. Marc Silberman's son Jeff came and shared his woodworking skills to plane down an old door. Another volunteer day upcoming February 24. Check out our volunteer page and tell us what you'd like to do to help and what days are best for you - or just show up on a scheduled day. We can use anything you have to offer!! More meet ups to come in 2018! Donations doubled in December! and more action! This month, all donations will be doubled. So please help us as we raise funds to put in a gas line for heat (it will get cold! ), electricity (the better to see you with) and bathrooms (well, you know). The money donated during our Indiegogo made possible a wall, concrete ramp and coated floor - ie a lower level ready to accept the first load of donated presses and type. Putting all our knowledge of mechanical engineering, physics and brute strength to the test...the first load of donated presses and type was moved into the Depot recently. Much much more to come, with your help. Concrete! I've always taken for granted what's beneath my feet. But the slurry! the choreography of pouring, raking, edging, smoothing! And then lo! we have a ramp. Thanks to your donations, for the first time since the building was moved to this location in 1994, an area drain and concrete steps and a ramp/drive mean we can move in our collection of printing equipment and type. Tom Parson can give a whole run-through of all that was done as our major ramp was laid down, but these pictures give a sense of it all. As soon as the concrete cures, the grand move will be possible! Volunteers are now clearing the lower room, sealing the floor, unplywooding the walls, and planning the layout for cabinets and presses. Join us in getting this prep work done. Thank you for your support! We are about to launch a double-your-donation effort for the next phase of construction, so if you missed out on supporting this ramp there will be more. Heat! Electricity! Toilets! And we need additional volunteers to help move our collection out of storage and into the building. Suggestions, donations, volunteer offers, and all questions are welcome. Email: englewooddepot@gmail.com or phone: 720-480-5358. Two days of learning all about pressure printing, layering, using color and shapes and anything that came to mind for some unique posters. So grateful to Brad Vetter for leading the workshop and for all those who attended, benefited the Depot and brought so much energy and fun. Progress this past month enabled by your donations! Curtis & Mitchell tabletop platen on a new hydraulic lift table…ready to print the winning design of art student Cassie Schaad, Platte Canyon High School: tickets for the Hootenanny! Newly donated Heidelberg on the move! We still need your support and involvement! Come volunteer, donate, check out our posters, memberships and other perks available on our website at www.letterpressdepot.com; further info by phone (720-480-5358) and email and by direct mail (Letterpress Depot, PO Box 798 Englewood CO 80151). John Major Jenkins was optimistic when he went in for surgery for kidney cancer in January; he even said he was doing well after the operation. But sadly, he passed away July 2 at the way too young age of 53. We knew John as a printer, as someone who was very knowledgeable and interested in presses, who regularly came down from Fort Collins for our Depot meetups. He shared blogs with us – which we are reprinting at http://www.letterpressdepot.com/blogs-on-type-presses-history/– on moving his humongous presses. And now he has left to the Depot the Campbell Century Pony press that he wrote about. Wish we still had John instead, but we are grateful to share this treasure. John also wrote movingly when his ex-wife died in 2015, acknowledging their ups and downs, but saying “from our first encounter in early 1996 … to our final farewell in early 2015, we loved each other.” In 2015, he also lost his 13+ year-old cat. John said since he didn’t have children, “Tyko was like my little boy, my papa wingnut.” Here are John and Tyko in happier and healthier times. John leaves behind two brothers, a sister and all the presses he saved and restored, which are now finding new homes with other printers. John leaves behind two brothers, a sister and all the press he saved and restored which are now finding new homes with other printers. It's been a busy summer and it's not nearly over yet! Upcoming are the Rocky Mountain Book and Paper Fair (Aug 4-5) and Boreas Pass RR Day (Aug 19). But here's a look back at the last jam-packed month. First and foremost in everyone's mind... progress at the Depot. Thanks to our Indiegogo campaign we were able to start the first phase of the work. Dirt in this case is a good sign! 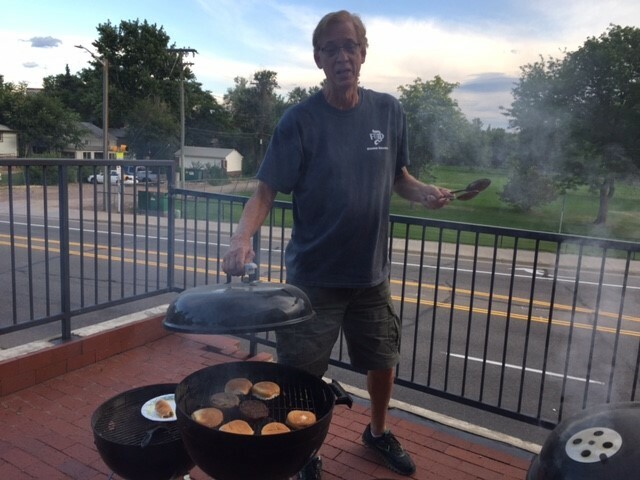 The Depot was also the site of a BBQ, poetry reading by Paul Hunter, poster display by Iowa printer Rick von Holdt, and a chance to just get together. Thanks to Len Lingo, grillmaster, and Chris Citron and family, helpers extraordinaire. One of the highlights of every summer: the Cherry Creek Arts Festival. We enjoyed printing for kids and excited adults alike, and spreading the Depot word. Mid-July update: Campaign raised 40k! A wall! Doors! A ramp! Happenings! OUR INDIEGOGO CAMPAIGN HAS CONCLUDED! Friends, we have concluded our Indiegogo campaign! We raised $27,222 on Indiegogo (we get to keep $24,974.34) and another $15,000 offline! Executive Director Tom Parson would like to pass on his thanks! “I want to express how much I appreciate the efforts and responses of support on all levels. This is an amazing accomplishment even if it falls short of our goal and our needs. Thank you all.” Though the indiegogo campaign wrapped up with an amazing response, we’ll still be fundraising through the summer and fall to complete phase 1 of the construction. You can always sign up for, renew, or upgrade your membership and we always accept and appreciate analog donations made out to “Englewood Depot Inc," at PO Box 798 Englewood, CO 80151. We will also be migrating all of our unsold perks over to our online store – where you can already check out all of the train themed posters. We’re currently about 2/3 of the way through mailing out the poster and book perks and are on track to get everything out by mid-August! For major donors owed custom printing and those of you who purchased custom printed posters, postcards, business cards, or signed up for individual and group workshops, we will be contacting you within the next couple weeks to coordinate with you! If you have any questions about your perks, printing, or workshops, feel free to email Executive Director Tom Parson or Board President Peter Bergman. 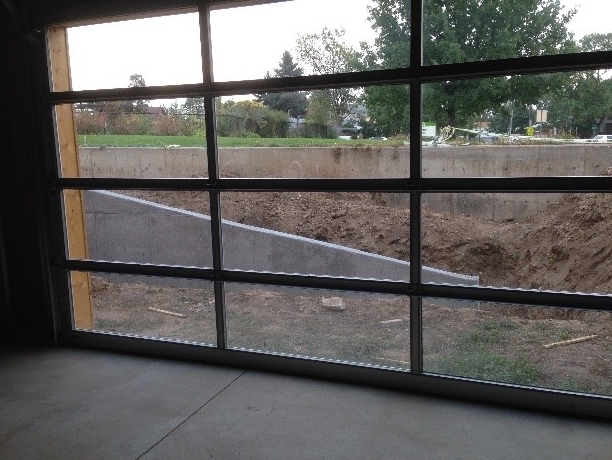 Where there once was an open cave there is now a wall and lovely garage doors! Half of phase 1 construction was building a lower level wall and installing doors. Thanks to YOU and your donations we have accomplished this! The doors bring a beautiful feel, light and ready, inside and out! The wall and doors now mean we will be able to start moving our collection of type and equipment in! The "porch"! Looking forward to future days unwinding here after a long day printing! We now have an ADA (and forklift) accessible grade on a ramp to the lower level and a "patio" – a place to land our 15 presses and 2,500 drawers of type as we move them into the building! Next steps are to get the retaining walls built, get concrete poured for the ramps, move equipment in, and paint the upper level! More funding is needed, but the depot space has a new presence and is showing a lot of progress! LETTERPRESS DEPOT IN THE NEWS! Thanks to Neenah Paper for Spreading The Word about The Letterpress Depot on Against The Grain – the Neenah Paper blog – with this article: All Aboard @ The Letterpress Depot! For an ongoing calendar of Letterpress Depot related events please see the EVENTS & WORKSHOPS section of our website! We still have three spots left in both the Pressure Printing workshop with Brad Vetter in October and the Ornamental Type Workshop with Jennifer Farrell in March. There are still spots left in both the Brad Vetter and Jennifer Farrell workshops! Tom crankin’ with a new letterpress afficianado! 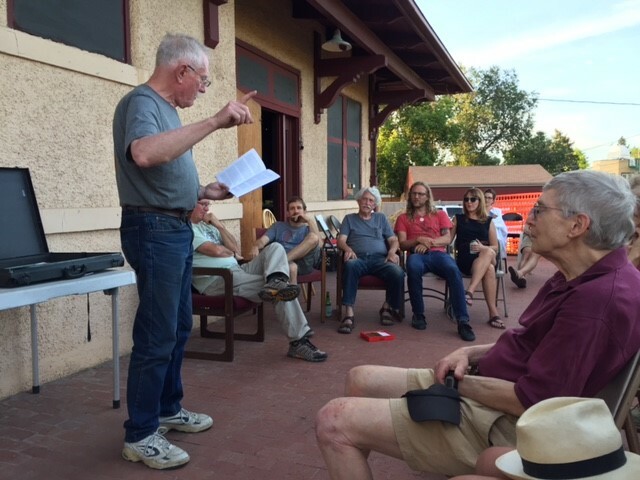 We had our first official event at the Depot hosting visiting poet and printer Paul Hunter for a reading and APA member and printer Rick Von Holdt with a pop-up poetry reading and patio potluck! Poet Paul Hunter warming us up with a song! Also stay tuned for an end of summer Englewood Community event for neighbors and Englewood residents! THANK YOU MAJOR DONORS FROM THE END OF THE CAMPAIGN! Paul Hunter brought ANOTHER donation with him on his visit to Denver and has become the first major donor to join our Benjamin Franklin Circle! Likewise, Polly and Bill Parson made a second major donation and jumped up to the William Morris Circle! We have new donors join the Frederic Goudy Circle – Bill Whitley, Lisa Abendroth and Eric Grattan! Bill Whitley has been involved with the Museum of Printing in Massachusets, and is helping a local history museum in Ft. Collins Colorado with an exhibit on printing in 2018 for which the Letterpress Depot will loan a small press! Lisa Abendroth is a Professor of Communication Design at MSU Denver and the co-editor of the Public Interest Design Practice Guidebook! When she’s not enmeshed in public interest design she’s rafting Colorado’s rivers and skiing it’s slopes with her husband Eric Grattan, an IT professional and avid outdoorsman. Tom and Marc helping Letterpress Depot member Natalie Zanecchia move her C&P! We also received a generous donation from Letterpress Depot member Natalie Zanecchia after board member’s Tom and Marc spent the day helping her move her C&P! This has been our fundraising model for a long time – help people with their letterpress equipment and projects and if they can help us with a donation great! Now we have a HUGE project that will enable us to help hundreds of people to learn and love letterpress and we’re asking for you to help us help them! Time to scrape and paint the depot? Keeping up with the yardwork and landscaping? Help with planning the library collection? inventory of type and equipment? Additional workshops and classes? Printing projects... Moving the equipment into the depot!? Help us celebrate!? To get more involved with our committees, board of directors, or volunteer opportunities please get in touch! THANK YOU SO MUCH FROM THE LETTERPRESS DEPOT! mid-June update: $20,000, a grant, VisitORS & weeding! Please help us out in the last two weeks of the campaign by donating and spreading the word about this ambitious project! For all of you who don't know what "The Depot" is, it's a historic building built in 1915 – one of two remaining Mission style train depots in the west! In addition to creating a museum, we’re working on restoring this beautiful building and creating a community center for Englewood Colorado! We're wanting to send a HUGE upside down and backwards THANK YOU to all of our donors large and small for getting us over $20,000 yesterday on Indiegogo! We're now only $1,500 away from paying for the retaining walls and grading to the grounds with two weeks to go in the campaign!! Every little bit helps us pay for that crucial step! Also a big thanks to Paul Hunter for upgrading from the Frederick Goudy circle to the William Morris Circle! Paul is a poet, musician, instrument-maker, teacher, and editor and publisher. For over a decade, he has produced letterpress books and broadsides under the imprint of Wood Works Press in Seattle – which you can check out and receive as a perk on your next donation! We're still $35,000 away from paying for the concrete ramp and patio needed to get our 15 presses and 2,000 cases of type into the building. We're looking at additional grants and creative construction if anyone has any ideas! Executive Director Tom Parson took a break from the fundraising to do what he does best – share knowledge about letterpress preservation and history with visiting Scottish printer and educator Mary Asiedu! Though Tom’s back yard is a relaxing ADA accessible location to talk letterpress it does have it’s limitations! That’s why we’re working so hard to find a permanent and home for our collection and a place for people to go for a deeper understanding of their craft – or even to touch type for the first time! Tom and fellow Depotians Peter Bergman, Mike Roberto, and Anna Goss took a break from fundraising to do what none of us do best! When you're on the board of a non-profit trying to restore a historic building sometimes you've just got to pull some weeds! Thank you Publication Printers and major donors! It's always exciting to open our Indiegogo page and see who has joined our effort. Relatives, friends, friends of friends, civic minded businesses and new supporters from around the world! Thanks so much! Today we want to especially thank our most recent major donors. Heading into Memorial Day weekend we're at $22,000 but still have 70% of our goal to reach in the month of June! Help us spread the word! "Publication Printers is a trusted leader in the web printing industry. We provide our clients with comprehensive expertise to successfully market and distribute magazines, catalogs, brochures, direct mail, digital editions and more. Family-owned and operated since we opened our doors in 1979, we are now one of the leading web printers in the United States. For 38 years we’ve upheld our reputation for quality, excellence and service. We take care of every aspect of the project from printing and binding to mailing and shipping." Publication Printers, which has a long history in Denver, supported us at the Johannes Gutenberg Circle level! In 1926, the Rosenbergs, a family of printers, came to Denver. In 1979, brothers Gary and IV Rosenberg founded Publication Printers, which prides itself on being innovative, progressive, and a trusted leader in the web printing industry. Publication Printers started out doing coldset newspaper printing and evolved into one of the country’s leading web printers, successfully marketing and distributing magazines, catalogs, brochures, direct mail, digital editions and more – taking care of every aspect of the project from printing and binding to mailing and shipping. Gary remains as president and CEO of this 2nd generation family-owned business. New William Morris Circle Members! Ken and Joyce Letzler – Retired attorney Ken has been named as one of the country's leading antitrust lawyers by a number of publications, but his firm also celebrated his baseball playing skills. Joyce is renowned as a gracious and welcoming host. Martha Cooper – Martha’s editorial career began with letterpress publications, both newspaper and magazines. She says “it's fun to see all the art being produced letterpress” and “doubly fun to see the Depot’s progress.” Martha Cooper has made her donation available as matching funds! If we can raise another $1000 over the next week we can deposit her generous $1000 donation! Board Members Made Matching Funds Available! Peter Bergman and Heather Link-Bergman are artists and printers who use letterpress in their work. Peter has been a board member since 2013 and President since October 2015. He teaches beginning typography students at MSU Denver how to hand set type and print on equipment and type that Tom Parson initially helped the university procure and set up. Both Peter and Heather also have perks to offer. Check them out. The other match comes from Tom and Patti Parson. Tom is our Executive Director, a master letterpress printer and the dreamer and visionary behind the Depot. Patti is the board’s secretary, in addition to being Managing Producer for the PBS NewsHour. She says her printing talents are minimal but enthusiastic! Tom also is a poet whose work is available as a perk. A Big Thank You To All of our Major Donors! Friends, board members and Publication Printers! We would not be where we are today without your support. THANK YOU SO MUCH TO ALL OF OUR MAJOR DONORS! 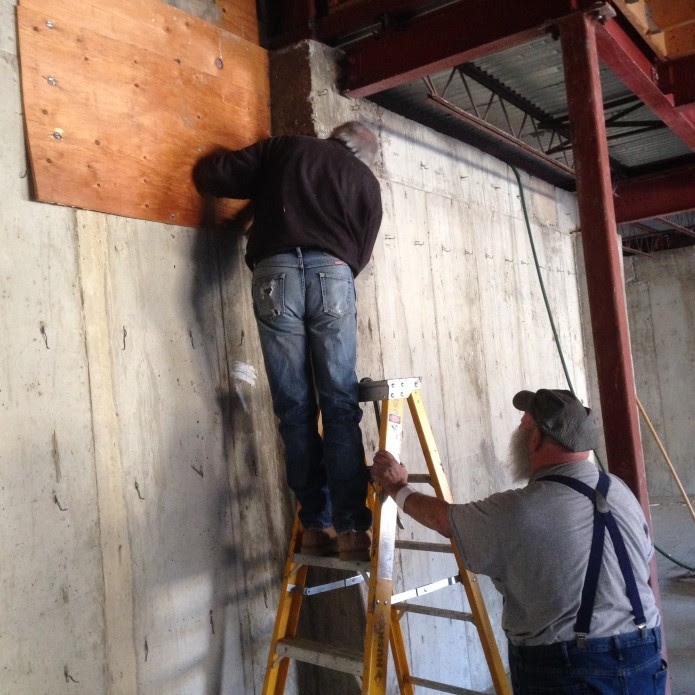 Construction underway at The Letterpress Depot! What’s happening under the blue tarp? Progress! We have secured permits and our contractor has started framing the fourth wall that was missing. This huge step was made possible by all who have visited, shared and donated to our campaign! We still have a ways to go towards reaching our goal for funding to complete construction, but we can’t stop smiling. And thanking you. Framing the wall to the basement pressroom! Help us crack 20k in 10 days! We've come a long way to get to this point! But, we still have a long way to go. Please consider supporting our campaign during this must-make fundraising initiative! See our indiegogo page to make a donation and check out our perks! This week we've got $2000 in matching funds from large donors and are trying to crack 20k by Thursday 5/25! Workshops from superstar letterpress printers! Once we get the building in order, we will be able to host workshops teaching letterpress printing and other book arts to individuals and groups – it’s part of our DNA, our reason for existing. But before our building is ready, you can take workshops with master printers whose work will make you say, “how did they do that?”. We have two new perks right now that will show you how. Jennifer Farrell, who runs Starshaped Press out of Chicago, created the ampersand print above (and many others) just out of regular and ornamental type. Her press is one of the few presses in the country producing commercial work while preserving antique type and related print materials. She will help you brush up on your understanding of typography and letterforms and show you how to create large, pictorial images with just type and metal ornaments. Beginners and seasoned veterans welcome! We are offering this 1.5 day workshop right here in Denver in late summer 2017 for 8 lucky donors. Check out our perk section to claim your spot. Brad Vetter, who spent eight years honing his craft at the legendary Hatch Show Print in Nashville, one of the oldest letterpress print shops in the country, will explore new (and old) techniques in letterpress printing, including pressure printing that creates unique and spontaneous images in his 1.5 day workshop. Along with, he promises, “some other fun surprises.” Brad runs his own letterpress and design studio where he continues to hand print rock-and-roll posters while also adding more digital design to his repertoire. This workshop will be hosted here in Denver in fall 2017 with spots for available for 8 donors who want to take their printing to exciting new places. To have both come to Denver to teach is a treat; to have them both heading our way to support the Letterpress Depot is an honor. And you don’t have to live here in Denver to come and learn. If you’re interested in traveling to Denver to attend this workshop please get in touch! We can help with any questions you may have. THANK YOU SO MUCH TO ALL OF OUR DONORS! Thank You To PUBLICATION PRINTERS which has a long history in Denver, for supporting us at the Johannes Gutenberg Circle level! In 1926, the Rosenbergs, a family of printers, came to Denver. In 1979, brothers Gary and IV Rosenberg founded Publication Printers, which prides itself on being innovative, progressive, and a trusted leader in the web printing industry. Publication Printers started out doing coldset newspaper printing and evolved into one of the country’s leading web printers, successfully marketing and distributing magazines, catalogs, brochures, direct mail, digital editions and more – taking care of every aspect of the project from printing and binding to mailing and shipping. Gary remains as president and CEO of this 2nd generation family-owned business. Letterpress Depot Indiegogo is live! Please support our Indiegogo Campaign! Our Indiegogo campaign is LIVE with a goal of reaching $70,000 to fully renovate the basement of our historic train depot building! With this initiative we'll be able to move over a dozen presses and hundreds of drawers of type into the building and start getting set up to open the doors! We have the presses and the place! Click the button to make it new! Long before text messaging, email or even typewriters, letterpress printing was the most common way share your thoughts and ideas through text dating all the way back to the fifteenth century. Our mission is to give hands-on access to traditional letterpress equipment to allow the community to continue to preserve, reimagine and redefine this beautiful art form for future generations. The future Depot beautifully rendered by board member Kim Morski! 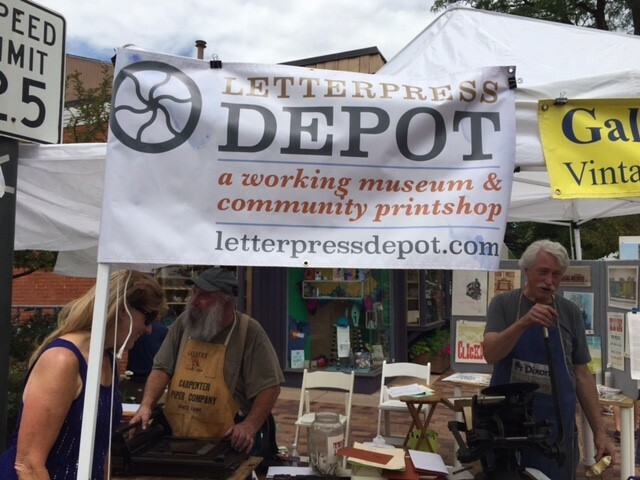 The Letterpress Depot is located in Englewood, Colorado just south of downtown Denver and has an active presence at community events all over Colorado. We are a 501c 3 non-profit with passionate volunteers and an active board of dedicated artists, printers, designers, professionals, writers, librarians, archivists, historians, dabblers, tinkerers, thinkers and makers. What we all have in common is that we have all fallen madly in love with the magic of letterpress. Sure, it may sound quaint, but we know there is something special about the smell of the ink, the feel of the paper, the weight of the type in your hands, the clanking and clinking of an old press and the joy of holding something you made with your own hands. Many artists and printers have dreamed of one day having a press and a space of their own and that is what we want to give to you by establishing the Letterpress Depot’s permanent homebase. Through this campaign we are raising funds to renovate our historic 1915 train depot into a unique home for our large collection of nineteenth and twentieth century presses and type. Our historic building was moved in 1994 to save it from demolition and after the relocation, the foundation was never completed — until now. 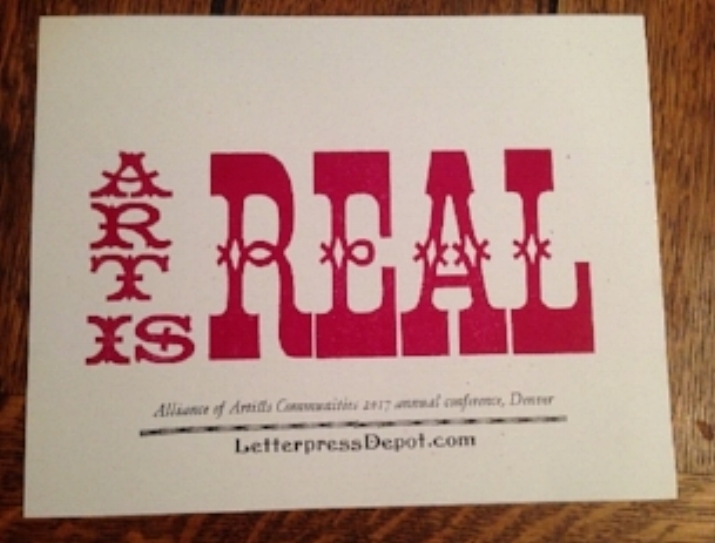 To take on this big project, we need the support of our community of passionate printers, artists, neighbors, history buffs, railroad aficionados and makers in Colorado and around the world. Our Executive Director, Tom Parson is the visionary behind our working museum. Tom’s philosophy is that to really know, appreciate and understand letterpress printing means getting your hands dirty learning how to use the type and presses – and to actually use them! You won’t find anything behind glass here. Everything including our most rare and antique type and equipment is here for you to look at AND touch! Literally tons of equipment – dozens of presses and thousands of fonts of metal and wood type acquired through our executive director Tom Parson and other generous donors. Lots of experience providing workshops, classes and demonstrations to people at all levels and of all ages. A dedicated, passionate and knowledgeable board, enthusiastic volunteers and a supportive network of friends in the community. We even have a CPA! An extensive library of books, some rare, on printmaking and design. A beautiful, historic building ready to be reborn. Once the basement pressroom is complete, visitors and community members will be able to learn from master printers and book artists – many of which are on our board – through a full rooster of workshops and classes. The Letterpress Depot will also provide access to equipment, studio space and its extensive library to local and visiting artists, printers, historians and scholars. Check our perks to see some of the amazing printers and artists who will be among our first visitors to work and offer classes at the depot. The Letterpress Depot will offer a full range of educational programming for all ages and skill levels — there will be something for everyone from beginners to master printers. Your contribution to this campaign will go to build a space where students, artists, designers, printers and the community can come for inspiration, hands-on experience and, most importantly, the fun of printing! We love the history of our building and all of its quirks and we are so excited to open it up to the community – even if you are not a printmaker you can appreciate the charm of our building and its story. We have the presses and the place, help us make it new!